Integrating key concepts from biology, medicine, neuroscience, and psychology, Ernest Rossi has forged a revolutionary new paradigm that encompasses mind, body, and spirit. 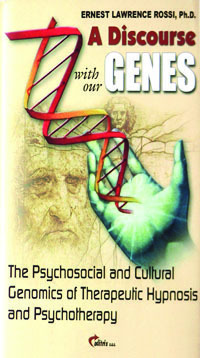 Rossi’s new world view–Psychosocial and Cultural Genomics–has profound implications for understanding the human condition. He describes how we can all learn to facilitate our evolving consciousness with numinous experiences of Art, Beauty, Truth, and Happiness in our daily creative work of building a better brain. As a pioneer in clinical psychobiology, Dr. Rossi shares his latest neuroscience concepts of a unified approach to Mind-Body Medicine and the practical methods self-healing in everyday life.